2019 MAZDA CX-9 with Android Auto and Apple CarPlay infotainment announced. Japanese automaker MAZDA today launches 2019 Mazda CX-9 in the U.S with a host of improvements led by the addition of factory-equipped Apple CarPlay and Android Auto infotainment technologies as standard equipment in Mazda CX-9 Touring trim level and above. 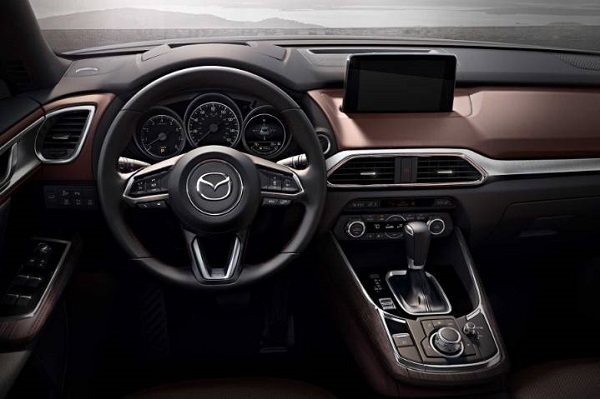 The entry 2019 Mazda CX-9 Sport comes with 7-inch MAZDA CONNECT infotainment screen. Upgrading from Mazda CX-9 Sport to the CX-9 Touring model adds 8-inch MAZDA CONNECT infotainment screen. The new 2019 Mazda CX-9 Touring features factory-installed Android Auto and Apple CarPlay infotainment technologies.